Gdynia-Kosakowo is the name chosen for the new international airport in Gdynia, Poland, scheduled to welcome the first passengers in 2013. Gdynia-Kosakowo Airport is expected to relieve the air traffic at the main airport of the area, Gdansk Lech Walesa Airport. The improved air access will also provide a necessary boost to the development of Tricity (Trójmiasto, in Polish), a conurbation of three coastal cities at the Baltic Sea: Gdansk, Gdynia and Sopot. See Tricity on the map of Poland. Recently another low cost airport in Poland opened. See Modlin Airport. New Gdynia Airport – where and when? The new airport for Gdynia is developing on the grounds of an existing military airport known as Babie Doly, 7 miles north of Gdynia city center. As of end of 2012 the main terminal construction works at the new airport have been completed and the roadworks on the new access way to the airport are in advanced stage. The inauguration of Gdynia-Kosakowo Airport is scheduled for the second half of 2013. In the initial phase of activity, the new Gdynia-Kosakowo Airport will be handling general aviation traffic operated by smaller aircrafts. Larger jet planes of charter, cargo and regular air traffic are planned to start taking off from Gdynia-Kosakowo by 2014. 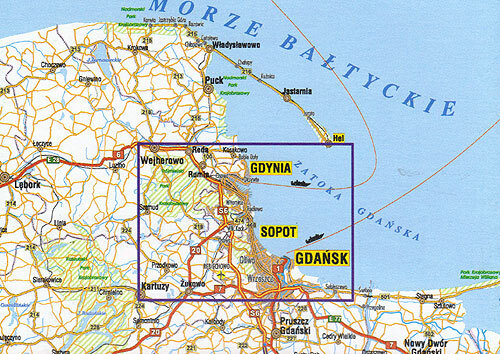 In the long term plans the new Gdynia Airport is supposed to assume the function of the low cost airport to the whole area of Tricity, being the already existing budget flights moved from Gdansk Airport entirely to Gdynia-Kosakowo. At the moment, there are two low fare airlines operating in Gdansk: Ryanair and Wizzair, but more budget operators are showing interest in the new location in Gdynia. Major car hire companies of Gdynia are expected to settle at the new airport. As of late 2012, car hire in Gdynia is available from a range of car rental suppliers, amongst them: Europcar, Express Rent a Car, Global Rent a Car, Auto Cool and 3citi Rent a Car. A number of well-known car hire brands operates at the nearby Gdansk Airport, namely: Avis Rent a Car, Alamo, Sixt, Hertz Poland and National. As soon as the first routes to and from the Gdynia-Kosakowo are announced, look for “Gdynia Airport” as a pick-up location on the Cartrawler search engine. The Tricity is an important economic and cultural centre in northern Poland. While Sopot, known as the “Spa town” of Poland and the historic city of Gdansk are also popular tourist destinations on the Baltic coast, Gdynia, so far, has been known mostly for its seaport, shipyard and business activity (headquarter of several international companies are located in Gdynia). A fairly new city, with limited historic heritage, Gdynia is aiming now to broaden its tourist offer. An improving transportation structure and a number of well succeeded initiatives from the local authorities are bringing more and more visitors to Gdynia. As an example: over 70.000 music fans from Poland and abroad visited the 2012 edition of Heineken Open´er Festival, a growingly popular music event in Europe. Read more about music festivals and other events in Poland in 2013. Article: Gdynia-Kosakowo Airport – new low-cost airport in Poland? Airlines at Gdynia car hire is available from Europcar, Express Rent a Car, Global Rent a Car, Auto Cool and 3citi Rent a Car. Look out for new car hire companies at Gdynia-Kosakowo Airport scheduled for inauguration in 2013. Heineken Opener Festival Poland.